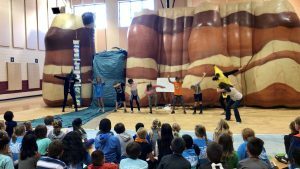 Big Canyon Balloon Visits Sharon Elementary! 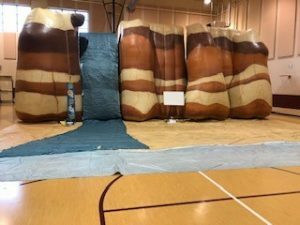 SUWANEE, GEORGIA – Rocky the Big Canyon Balloon had a blast visiting the 3rd and 5th graders at Sharon Elementary on Halloween! What a fun day to be at Sharon – teachers and students know how to show Halloween spirit! Rocky fit right in: he came dressed in his Halloween costume. Can you tell what he’s dressed as? Bacon, of course! He quickly made friends with 3 girls dressed as a BLT – he fit right in! 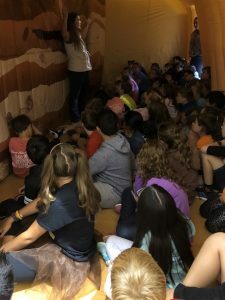 The 5th graders ROCKED with their knowledge of rocks, minerals, and fossils! The erosion dance was the first Ginny had ever danced with a banana and a witch! 3rd grade explored fossils and rocks vs minerals – we sure enjoyed their enthusiasm and their clever answers. Great job figuring out what happened to the waterfall as we time traveled hundreds and thousands of years into the future. Where did all of that rock go? Thanks for letting us enjoy your fun school on such a fun day! Rock on, Sharon!